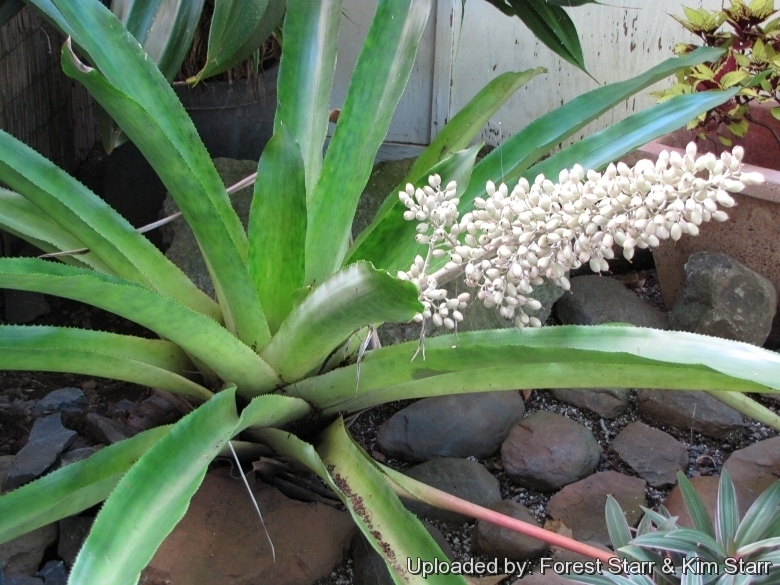 Origin and Habitat: Aechmea lueddemanniana is a wide ranging species native to Costa Rica, Guatemala, British Honduras, Belize and southern Mexico. Altitude range: 400-900 metres above sea level. Habitat: It grows in the rain forests as an epiphyte or saxicolous (found both on trees and rocks) or occasionally as a terrestrial plant. Description: Aechmea lueddemanniana is a handsome bromeliad with colourful mottled leaves and attractive, tall inflorescence, and ornamental white and purple fruits. It is also showier long after the flowers have faded. Each plant will get about 25-45 cm tall (up to70 cm when flowering) and 60-90 cm wide. It is quite variable. Rosette: Cup-shaped with leaves overlapping each other in a formal arrangement, straight or slightly curved gracefully outward and downward producing the effect of a fountain. Bromeliads are often referred to as “tank plants”, since the spiralling leaf bases of a rosette overlap so tightly that forms a central well-like enclosure that water collects in it. Leaves: Arching, elliptic densely pale-scaly, expecially beneth; sheaths large; blades about 25-60 cm long and 4,5-6,5 cm wide, acute or rounded with a short strong point, margin with 1-2 mm long spines. Leaf surface changes its colour according to light and temperatures, and it can range through shades of green, bronzy-roze and very dark purple. Inflorescence: Paniculate. Scape, erect, slender 25-40 cm long and about 6 mm in diameter, the panicle (spike) is cylindrical 12-30 cm tall and 5-10 cm wide, white-mealy and covered with a fine silverish scurf. Flowers: Small, tube-shaped, pink to lavender or blue in colour. Sepals about 3,5 mm each with a broad, lateral wing. Petals about 9 mm long, pink and blue turning dark carmine-red. Blooming season: The flower spikes appear from spring to mid summer. Fruits (Berries): Green first, then white which last several months and then gradually turn purple. The purple berries will remain in colour for a couple of months before finally shrivelling and falling from the plant. The prodigious quantity of self-set berries allows for an other learning and growing opportunity, growing bromeliads from seed. 1) Forest & Kim Starr “Aechmea lueddemanniana (Bromeliad)”. Plants of Hawaii. <http://www.starrenvironmental.com>. Downloaded on 21 August 2014. 4) Espejo-Serna, A. & López-Ferrari, A.R. (2005). “Bromeliaceae. Flora de Veracruz” 136: 1-307. Instituto Nacional de Investigaciones sobre Recursos Bióticos, Xalapa, Veracruz. 5) Espejo-Serna, A., López-Ferrari, A.R., Martínez-Correa, N. & Pulido-Esparza, V.A. (2007). “Bromeliad flora of Oaxaca, Mexico: richness and distribution.” Acta Botanica Mexicana 81: 71-147. Instituto de Ecología A.C..
6) Nelson Sutherland, C.H. (2008). “Catálogo de las plantes vasculares de Honduras. Espermatofitas: 1-1576.” SERNA/Guaymuras, Tegucigalpa, Honduras. 8) Balick, M. J., M. H. Nee & D.E. Atha. 2000. “Checklist of the vascular plants of Belize.” Mem. New York Bot. Gard. 85: i–ix, 1–246. 9) Breedlove, D.E. 1986. Flora de Chiapas. Listados Floríst. México 4: i–v, 1–246. 10) CONABIO. 2009. “Catálogo taxonómico de especies de México.” 1. In Capital Nat. México. CONABIO, Mexico City. 11) Davidse, G., M. Sousa Sánchez & A.O. Chater. 1994. “Alismataceae a Cyperaceae.” 6: i–xvi, 1–543. In G. Davidse, M. Sousa Sánchez & A.O. Chater (eds.) Fl. Mesoamer.. Universidad Nacional Autónoma de México, México, D. F.
12) Luther, H. E. 1995. “An annotated checklist of the Bromeliaceae of Costa Rica.” Selbyana 16(2): 230–234. 13) Morales, J. F. 2003.”Bromeliaceae. In: Manual de Plantas de Costa Rica,” B.E. Hammel, M.H. Grayum, C. Herrera & N. Zamora (eds.). Monogr. Syst. Bot. Missouri Bot. Gard. 92: 297–375. 14) Smith, L. B. 1958. “Bromeliaceae. In Standley, P.C. & Steyermark, J.A. (Eds), Flora of Guatemala” , Part I. Fieldiana, Bot. 24(1): 380–476. 15) Smith, L.B. & R. J. Downs. 1979. “Bromelioideae (Bromeliaceae)”, Part III. Fl. Neotrop. 14(3): 1493–2142. 16) Stevens, W. D., C. Ulloa Ulloa, A. Pool & O. M. Montiel Jarquin. 2001. “Flora de Nicaragua.” Monogr. Syst. Bot. Missouri Bot. Gard. 85: i–xlii,. 17) Utley, J. F. 1994. 16. “Aechmea Ruíz López et Pavón, nom. cons.” 6: 150–155. In G. Davidse, M. Sousa Sánchez & A.O. Chater (eds.) Fl. Mesoamer.. Universidad Nacional Autónoma de México, México, D. F.
Cultivation and Propagation: Aechmea lueddemanniana is one of the most ornamental bromeliads for the cool greenhouse, due to the beauty of the foliage, inflorescence, fruits and the facility of cultivation. Growing substrate: This bromeliad grows as an epiphyte or saxicolous and requires a well-drained, aerated, porous and moisture-retentive substratum which is rich of organic substance, but best results are obtained when it is grown epiphytically and roots are covered with moss or coarse crushed tree fern fibre encased in a container or wired to the surfaces of boulders, rough bark, rock walls, or tree branches. Root rot can be a problem if the soil is too moist. Exposition: The Aechmea lueddemanniana prefers partially shaded areas and grow best where they'll get morning sun, or shifting shade throughout the day. Watering: It enjoys constant moisture from rain or sprinkler. In dry and hot climate, humidity can be increased with nebulisations utilizing water at room temperature and not calcareous. In summer, some distilled water can be left in the central cavity formed by the rosette of leaves, renewing it frequently to avoid the formation of a mosquito larvae nest, whilst in winter it is better to leave it dry, thus avoiding possible rottenness. Requires complete and perfect drainage. Fertilizing: Apply mild solutions (one-quartet strength) of foliar fertilizer at 3-month intervals to both garden and container plants. Hardiness: It is cultivated in open air in the tropical and humid subtropical climate countries, with temperatures which it is good to keep over the 14°C, best 20-24°C, but it can also be grow outdoors in the warmer areas of the Mediterranean and is fairly cold-hardy, surviving brief freezes with little damage, in these situations it will better resist if sheltered by the winter rains, seen that the humidity and low temperatures render it more sensitive to rottenness. It should be protected from any snow or long lasting frost. Pest & diseases: It is susceptible to scale, trips and mosquitos that will sometimes breed in the pools of water that are trapped between the leaves. Mealybugs infestations are also a frequent problem. Pruning: Remove old leaves from plant base and dead ﬂower spikes only. Remove older plant crown when it begins to fade. Use: Specimen plant; mass planting; container plant; tropical foliage and colourful ﬂowers. Propagation: Remove and replant offshoots from the base of the parent plant. 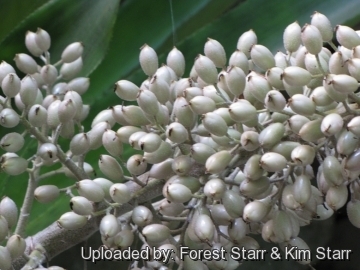 May also be grown from seed: remove seeds from inﬂorescence and lay them uncovered on a bed of crushed tree fern ﬁber; keep constantly but moderately moist. Starting from the seed, 5-6 years are needed for the blossoming, whilst at least 3 years are needed by division. The wide scale reproduction for commercial purposes is done by micro-propagation. Warning: Has sharp spines that deter some gardeners.